1. Never again forget an appointment, family occasion, or event. You can set notifications to be delivered via a popup message on your desktop, email or text message on mobile devices. You can even specify multiple reminders, or customize how long before the event the reminder should be sent. 2. It's easier to make new appointments. I've gotten into the habit checking my Google Calendar when making my next appointment with a doctor or dentist. This eliminates guesswork ("Hmm, I'm not sure if I'm available that day, but let's go ahead and make the appointment anyway…"), and potential conflicts with other meetings or family members' activities. And because I enter the appointment into my calendar right when I make it, that eliminates the need for the receptionist to hand me a reminder card that I'll probably lose. 3. Never again will you have to postpone accepting an invitation (or declining it). Google Calendar is available wherever Internet access is available, on Android, Apple and Windows computers, phones, and tablets. It’s even available offline; any changes you make to your local Calendar are synced with the Google cloud-based service when you connect to the Internet again. 4. Never again wonder when everyone can get together. Coworkers, colleagues, friends and family members can share Google Calendars among themselves, so that everyone knows what everyone else’s schedule is. Suggesting a get-together is much easier if you know when it is feasible for invitees. I share a Google Calendar with my wife, so when I add an appointment to my calendar, it shows on hers, and vice versa. You can also make a Google Calendar public so anyone can see it; this feature comes in handy for school administrators, churches, and others who publish calendars they want the public to see. 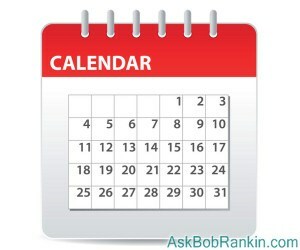 There are many public Google Calendars of holidays, moon phases, and other future events that can be imported into your own calendars or shared with others. 5. You can send invitations and track RSVPs in Google Calendar. The invitation-composing module includes a “find a time” feature for groups that share calendars with each other. You can also specify what guests can do in response to your invitation, i. e., just RSVP yes or no, or reply with comments or suggestions that are available only to you or to all invitees. 6. You can import existing calendar data files from any calendar program that uses CSV or Apple’s iCalendar data format. There are some limitations to importing data; in particular, recurring events may not import properly. Each program has its own procedure for exporting calendar items to a CSV file; some are easier than others. 7. Of course, Google Calendar has Google Search capabilities. If you have ever struggled to find a calendar entry using the rudimentary search function of Microsoft Outlook, this point alone might persuade you to switch. I've used this to answer questions like "When was my last dentist appointment?" and "How many times did I give blood last year?" You need a Google account to use Google Calendar. If you already use Gmail, Google Docs, or any other Google product, you have a Google account. Aside from that requirement, Calendar is free for general use. You don’t have to chuck your current calendar app to try Google Calendar. Once you’ve experienced it, you may never go back to your old calendar. One feature I really like about Google Calendar is recurring events. I use it to remind myself when it's time to take out the trash each week, when the dog needs his heartworm pill, and when certain monthly bills are due. And when I want to make sure I remember to do something a week or a month later, I do a Quick Add, and I don't have to worry about forgetting it. Most recent comments on "7 Reasons to Use Google Calendar"
I am off topic, but I love the cact that you have a WIFE. Not just a partner It gives me more confidence in your opinions since you respect age old values. I've used Google Calendar for several years and love it but have an issue with syncing. If I enter an event in my computer, it will sync with my Android phone (Motorola Droid Razer Maxx HD) but not the reverse. If I enter it in my phone, it will not display on the calendar on my computer. Any ideas? I have found that appointments I enter in calendar with people in my contact list will pop up on my NEXUS 7 with info on what time I have to leave to arrive on time. On some it even gives traffic reports if major highways are involved. Put all my "reminders" - - take out the trash - - on one calendar but do not have that calendar "showing" every day. Have a different color for every calendar and I can tell immediately which events are "important" and which can be skipped or rescheduled. I much prefer www.cozy.com. Does everything that Google Calendar does without Google spying on you. My quandary is simply that IT IS GOOGLE...which means that although it might not be made "public" I HAVE to assume that even my calendar data is being stored, viewed and probably bundled and sold to the highest bidder. Because of my paranoia (real or contrived) I've been researching ways to move AWAY from Google. The problem? Not much out there that matches the user-friendly, multi-platform, all-in-one utilitarianism that Google has hooked everyone with. As they say, there's no such thing as free. But, I am starting to feel like my privacy has just a bit more value than the convenience Google offers. google calendar is great. i have it synced with my blackberry and a calendar that is on my main screen of my pc. when i wake up in the morning and go on my computer it is right there in front of me and as i update the calendar on my phone it automatically updates online and on the pc. Small correction. My comment above should have read www.cozi.com not www.cozy.com. Last time I used Google's calendar, I couldn't find a way to specify how long an event should last or when it should end. But my main reason for not using it is that I don't want to let Google know my plans. So now I'm happy enough using a spreadsheet but I'll take a look at Calendar Creator and cozy.com. Wow! I'm surprised at the number of responses to this - both on point and off point! I've used several calendar programs over the years and keep coming back to google. It's easy & efficient as many commenters have noted. I like that when making reservations it's so easy to post them to my calendar with a simple click. I use Microsoft Outlook for my calendar and regularly print out the next two months on the front and back of a sheet of paper, to have it handy when I'm not at my computer. But that's only because I need to meld my personal activities with my business meetings, and my company uses Outlook for all its employees. Meanwhile my daughter, who runs her own business, uses Google Calendar exclusively. I can share it with her, to see when her appointments are, and I also include my own trips and other major activities which she can see. Some day if/when I retire I'll probably switch over exclusively to using Google Calendar. One nice feature that you didn't mention is that I can automatically import the game days and times for my favorite football team (the Green Bay Packers) into Google Calendar. That helps me work around them when I'm trying to schedule other things (which by definition are less important). I'm not too concerned about the risk that the NSA will track me via Google Calendar. This is not to downplay the very serious and illegal violations of our privacy by the NSA and other government agencies, nor the danger that they are tapping into Google's computers and communications. But if government agencies really want to track me personally, I very much doubt that my avoiding Google Calendar would significantly crimp their efforts. I have used Google Calendar for years and think it's great, specially the way it syncs from PC to tablet to phone. I just wish it had been available when I was still working and switched from a paper daytimer to a PDA before I even knew what a smart phone is. I still had a clamshell cell phone in those days. I love the Outlook calendar and use it extensively. Yes, I need to be home to make an entry and there's no sharing but that's fine for me. I'd be lost without Outlook! I have installed google calendar on my Samsung note3 and it will sync with the samsung calendar on the phone but wont sync with the google calendar on my laptop. Any suggestions. I tried to post this before but the post wouldnt go through?? Why don't you let your readers know how much Google paid you to push this TRACKING MONSTER calendar on them. Funny how this article went out at the same time another article called 'Why Google is the New Evil Empire' hit the internet. One qualm that I have with Google Calendars is that "all day" means GMT midnight to GMT midnight. If you are not in the GMT timezone, your times will be skewed. Thanks again Bob. Another thing I've been looking for. I checked out some of the Calendar apps that others suggested but I went for Google because it seems easier since I have Gmail already and I don't have to install anything. I really appreciate your emails. I have zero interest in providing Google with even more information than they have already sucked away. The handiest calendar I have is a paper one because it doesn't depend on batteries or electricity for me to view it, I can take it anywhere without annoying other people with noise and lights, and I only need to share what I choose to share without needing Google to decide for me what will appear. No Google, especially as a verb, for me. Oh for Christ’s sake Grant, take a chill pill or other medication for your delusional paranoia. My closest friend also harbour's a mindset close or identical to yours and has done for years. I blithely put it down to his early Uni days when he frequently partook of 'happy baccy'. To accuse Bob of what you have is totally unacceptable if not insulting to me and I'm pretty sure many of his subscribers - Bob is a totally good bloke as his long term and outstanding contributions have clearly demonstrated. And on point – I have been using Google’s calendar for yonks and find it the best thing since sliced bread – though I’m a little leery of that black SUV full of guys in similarly coloured suits that seem to be trailing me.